I am not technologically savvy nor am I a fan of the gaming world. I often see people on public transportation playing with their NDS or various games on their phones, but I have never been immersed. What is Xbox or PSP? I haven’t quite discovered the gaming world, but was exposed to Wii last year when I visited my friend in Singapore. I got so into the sensory movement technology I was hooked playing Wii Fit. I was so excited over it, I made my friend head down to Vivocity and haggle a “cheaper” price for the machine with the Wii board and Mario racing game. I actually lugged the entire system plus a Wii Fit board from Singapore to Hong Kong. People in HK asked me if it’s that much cheaper in Singapore, and I was like, “No, I just wanted to HAVE IT NOW”! Recently, I got my hands on the XiviX at a dirt cheap price that makes gamers all over the world jealous. It is a relatively new game console and not advertised and marketed as extensively as the Wii, PSP, or XBox, but this game console offers the same sensory interactive experience that I love so much from Wii. 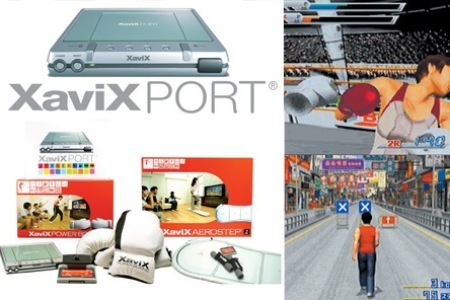 I like Wii Fit so much that I got interested at the special deal for the XiviX since it is a more sport oriented console and the games & accessories for the system are all sports related. The crazy dealer in Hong Kong is offering the game console plus two sports games (Power Boxing & Aerostep) for the dirt cheap price of less than $40USD, that’s less than 10% of the Wii I bought! How can I resist the deal? From the Wii fit game, two of my favorite games are the “stepping” and “boxing” games under Aerobics, so when I learn of the XiviX deal, I am the first one sold! My sister is visiting HK from Vancouver and she got mega excited and is lugging the game console and the two sports games all the way to Canada! Just like myself, she is lugging a game console overseas, but clearly, people will think she is a lot brighter for doing it! The graphics from Wii is definitely a lot better than the Xaivix, but for such a cheap price, I can't complain. It is still exercise! A lot of serious sports buff most could definitely not understand why people would imitate exercise at home with their game machines. I can think of a million reasons I would rather sweat in the comfort of my own home than going to a fitness center. First of all, I wear makeup, so if I go to the gym, does that mean I need to remove my makeup before I go onto the sport machines? Or should I keep my makeup on and “look cute” while sweating up a storm? After an hour of workout, I need to spend close to an hour in the shower room showering, blowing my hair, and reapplying my makeup?! Hmm…as a girl, that would keep me away, too time-consuming. Hey, I am still exercising, I am embracing technology and the ability to look shoddy and ugly while exercising in my home. Best of all, if I am mega tired after a workout, I can just lie down and bum; who am I kidding? I am a couch potato.